We really need to cook with shrimp more often. They are super-healthy and cook in a flash. And we both love shrimp. The only drawback is that I’m picky about seafood and like my shrimp fresh. And since I do all of my shopping for the week on Sundays, if we’re going to have shrimp, it’s going to be either Sunday night or Monday night at the latest. I really wouldn’t let shrimp stay in the fridge longer than a day. 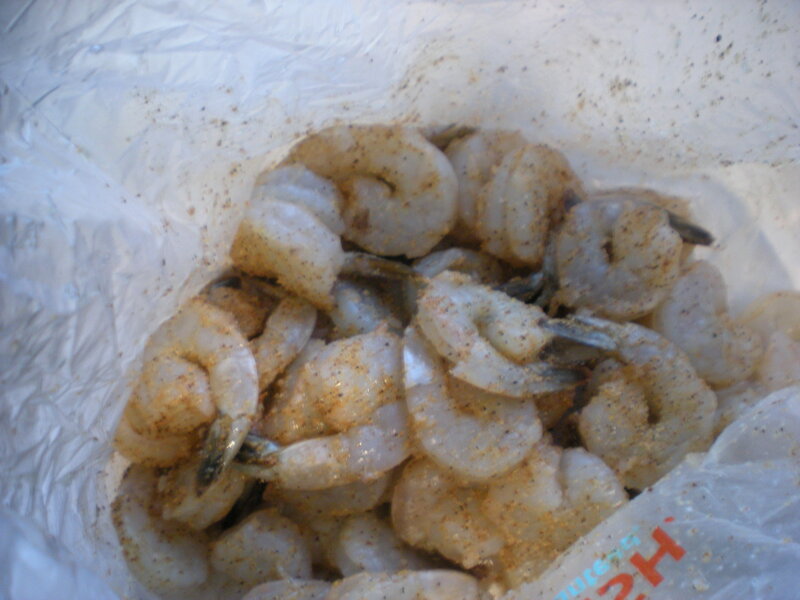 Toss shrimp with cajun seasoning in the bag that the shrimp comes in and set aside. Heat 1 tbsp olive oil over medium-high heat and saute the peppers about 5-6 minutes, but not until they are totally tender yet. Add the garlic, being sure to toss continously to keep the garlic from burning. 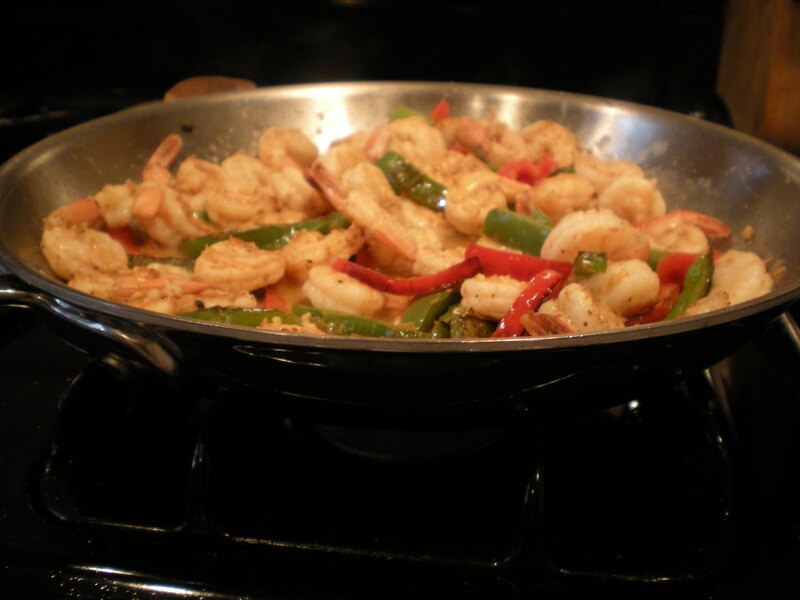 BEGINNERS TIP: I use tongs to saute peppers and also to cook the shrimp. It makes it easier to grab several and toss and turn. Remove the peppers and garlic to a plate and set aside. Return the pan to medium-high heat and add a 1/2 tbsp of more oil. Add shrimp and cook 3 minutes, turning frequently. BEGINNERS TIP: cooking shrimp is delicate. They cook fast, no more than 5 minutes total. Just watch them closely and turn them as they start to turn opaque. You don’t want them really pink, then they are over-done. You really just want them opaque, as they will continue to cook in the hot pan, even after you’ve turned the heat off. Add the wine, lemon juice, peppers/garlic back into the pan, mix with the shrimp and cook another 2 minutes, being sure not to over-cook the shrimp. Serve with brown rice and hot sauce, if preferred. This year, I’ve decided to start an herb garden. In the spring and summer, I am known to spend a small fortune buying herbs for just one recipe — a little rosemary or basil at the store is like $3.99 and you use it once before it goes bad. And Frank’s personal pet peeve, when I would buy $2 worth of parsley just to garnish something. 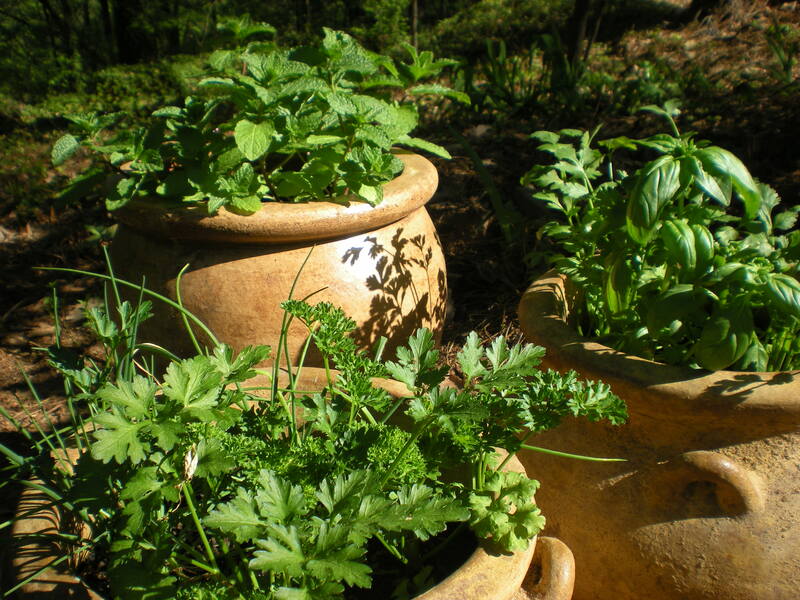 But, for less than that one container’s worth at the store, you can plant that same herb and have it all summer long. So far, I’ve got basil and cilantro, chives and parsley (both flat leaf and curly), mint and a rosemary bush. All for like $30.00, the rosemary bush being $20 of it. It’s really a no-brainer, it just takes a little dedication to get it going. Here a few tips I’ve picked up this spring from the professionals at the nurseries. If you live in the Birmingham area, Colliers Nursery has beautiful herbs and very knowledgable people to help you maximize your plants. Use containers instead of planting in the ground. 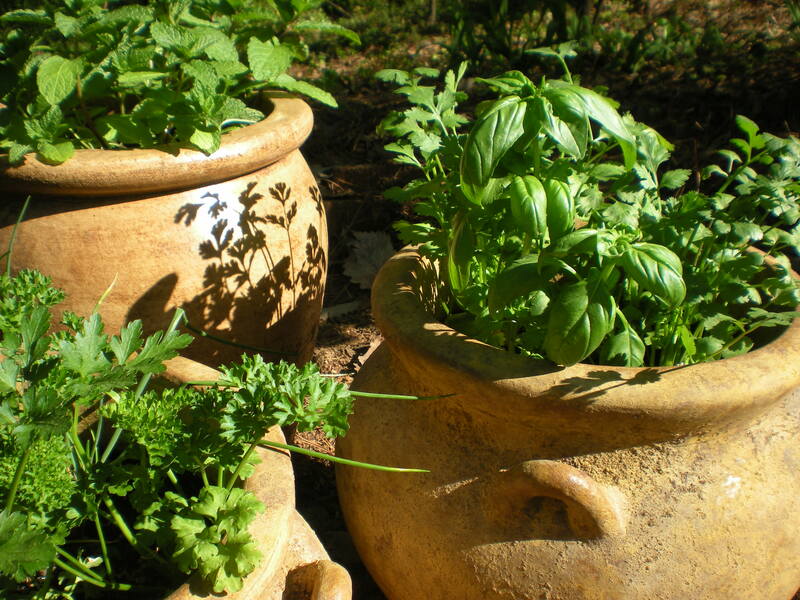 They will need more frequent watering, but you can move them inside in the event of a drop in temperature and you can control the herbs that tend to take over your yard, like mint. Invest in good potting soil and plant food to give them a good start. Then, all they will need is water. Make sure you position your garden in full sun. Ours is in a strange part of the yard, but it’s the only part with full sun that isn’t already in use by other landscaping. This time of year, you can get away with watering every other day, but in the real heat of summer, you need to water them every day, especially if you use containers and not a planting bed. Rosemary is a low-maintainence shrub and great for landscaping needs. If you plant it in the ground, leave a little of the bush sitting up and not buried. Also, I’m told that you should plant rosemary in less than great soil. This keeps the rosemary root ball short and stumpy, but maintains the flavor of the herb. If it’s in really good soil, the roots spread out, go deep and the plant loses it’s flavor. You can plant different types of herbs in the same container, but mint tends to take over, so keep it in it’s own planter. My sweet friend, Lindsay, made this dish for us one night last summer. It was one of the first times I met her now-fiance and we had such great fellowship sitting outside on her patio and drinking wine well into the night. We sort of made this up that night and since then, Frank and I have duplicated it many, many times. 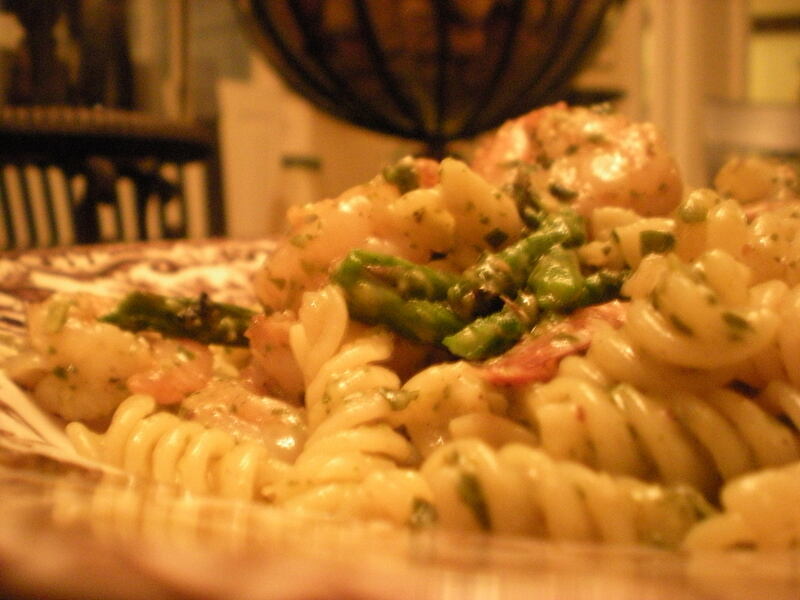 It’s a simple, fast, healthy (if you use the reduced fat pesto) and filling dinner and it is also great for a dinner party because it can feed as many people as you want — just be sure to check for shrimp allergies/hatred. If shrimp is a game-breaker, just substitute chicken. In the sack that the shrimp comes in, shake a healthy amount (maybe 2 tbsp) of Old Bay Seasoning and then shake and roll the bag around to coat the shrimp. Move to a grill basket. On a cookie sheet, roll asparagus in olive oil (maybe a tbsp) and S&P to taste. Grill the shrimp and asparagus. Put the asparagus on first, it takes longer than the shrimp. BEGINNERS TIP: Shrimp are done when they are lightly pink and slightly opaque, no longer than 5 minutes, usually. Take them off the heat as soon as you think they are ready and put them on a cold plate; otherwise, they will continue to cook on the hot grill pan and get too tough and overdone. While they grill, in a large dutch oven, cook the pasta according to box instructions, drain and put the pasta back into the pot. While the pasta cooks, in a small saucepan, heat up the pesto on a very low setting. When selecting your pesto, get the kind that is refridgerated, in a small tub (Bertolli is a good brand). This section at the store is typically where they keep refridgerated pastas and cheeses. When the aparagus is ready, move to a cutting board and chop the first 2/3 of the stalks into bite-size pieces. Add to the pasta. 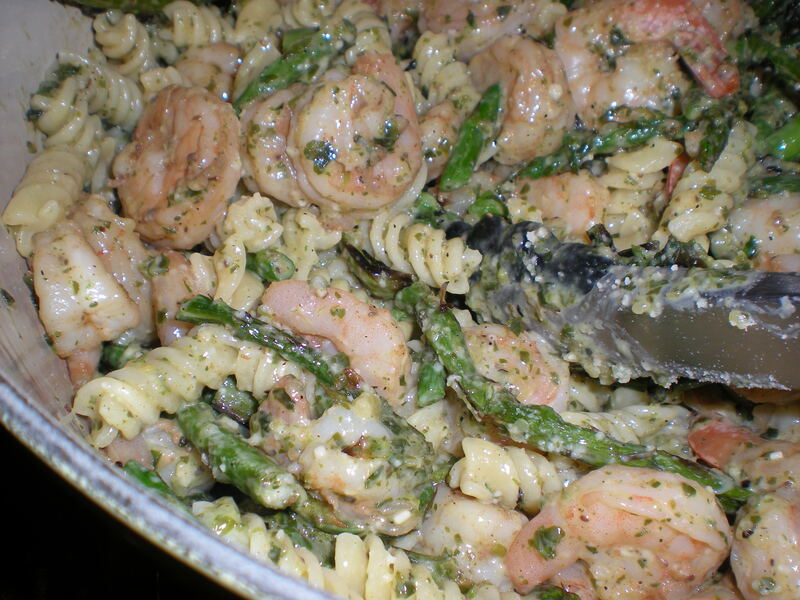 Add the shrimp as well, then using a spatula, add the pesto and mix well. Add the cheeese and another dash of salt and mix again. Serve immediately; preferably with a crisp white. This dish is perfect for dining al fresco in the upcoming nice weather. Enjoy! If you have seen Julie and Julia or ever attempted coq au vin, you know there is an art to browning mushrooms. But once mastered, the pay-off is huge. Juicy, browned mushrooms can add so much flavor to a stew, cassoulet or just as a side by itself with a steak or hamburger. They are simple to prepare, you just need to follow these few tips below. Be prepared to seriously impress your dinner guests with a sophisticated, fancy-looking, uber-French dish. The first thing to do is get the butter very hot over medium heat. You know when butter is hot enough when it has stopped sizzling and bubbling up and is frothy, but resting. Then, add the mushrooms. Make sure they are washed, but dried very well. The second key thing is to NOT CROWD THEM. Give them space, even if this means having to cook several batches to complete your dish. 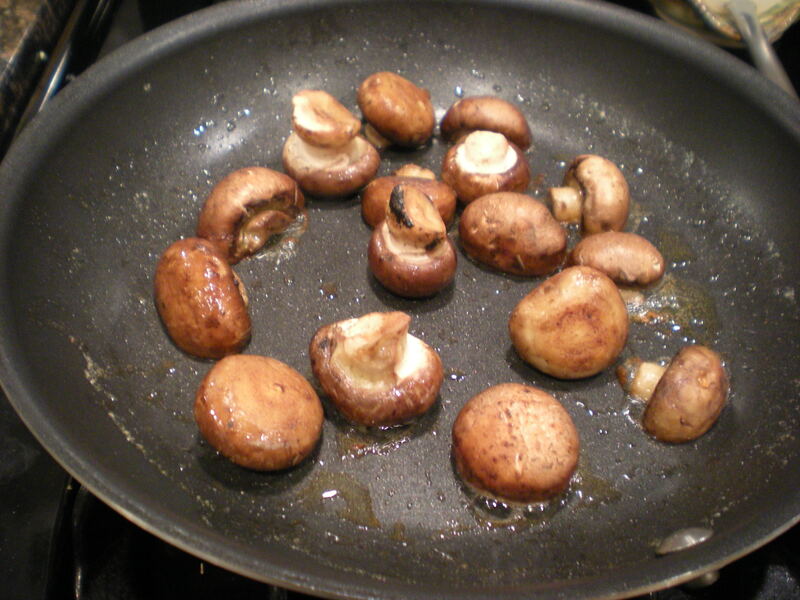 Mushrooms will quickly absorb the fat, but as they cook, they will release the butter or oil back out and you’ll see the shiny fat on the surface. So resist the urge to add more butter or oil; there is plenty there and the mushrooms will release it back as they continue to cook. If you crowd them, all you do is steam them and not fry or brown them; they release their juices and don’t brown up. Allowing them space in the pan reduces this steam effect. Also resist the urge to stir them a bunch or turn them several times. Just turn them every so often to get them equally brown on all sides, but let them do their thing in the pan. They really only need about 5-7 minutes total. Remove from heat as soon as they are ready and season with just a bit of S&P. I can’t take credit for the idea for this post. The latest issue of Cooking Light (one of my absolute favorite publications) has an article called the 25 Most Common Cooking Mistakes and How to Avoid Them. I was reading it the other night and was amazed at how many of the things on the list I do on a daily basis. While all 25 tips are excellent reminders of technique and common sense, I’m sharing just a few of the ones that I am guilty of the most. Read the rest of the article at cookinglight.com or click the article title above. If you happen to know me well, you’ll start to see a pattern linked to my personality fairly quickly — I’m always, always in a rush. A lot of this has to do with my job — deadlines, deadlines, deadlines all day long, on an hourly basis, total chaos all the time. But I’m trying to learn to slow down life a little bit and these few common mistakes that I make remind me to chill and ENJOY my favorite hobby. Hope you learn something here too! 1. You pop meat straight from the fridge into the oven or onto the grill. This makes the meat cook unevenly — the outside gets too done while the inside remains undercooked. Reason being, the meat gets so cold in the fridge, if it’s not allowed to warm up just a bit, it won’t cook thoroughly on the inside. So, the outside cooks normally and looks ready, but the inside isn’t cooked to a safe temperature. Solution: Let meat stand at room temp for about 15-30 minutes, depending on how big the cut is. Regular weeknight chicken breasts only need 10 minutes or so, but this helps tremendously. 2. Meat gets no chance to rest after cooking. I thought this was really interesting. I know you’re supposed to let your beautiful Christmas Day rib roast stand for a bit, but this is true for all meats. If you slice any meat too early, the juices (and flavor) are released onto your countertop, leaving the meat dry. If you let it stand for a bit, the cooling off time lets the juices migrate to the center of the meat, retaining the flavor and juiciness. For a large cut of meat, let it rest for about 20 minutes; chicken breasts and individual steaks just need 5 minutes. If you’re worried about keeping it warm, loosely tent aluminum foil over the meat. 3. You turn the food too often. I’m getting better at this, but the fact remains. It’s tempting to turn your nicely breaded chicken breasts or fish fillet in the skillet too soon. All this dones is scrape your breading or seasoning off the meat, resulting in not a nice crust but a soggy bottom. Learning not to turn the meat or rush the cooking was so hard for me. I kept thinking I was burning the bottom, but if you have enough fat (olive oil, butter, cooking spray, whatever) to saute or fry, you need to let it cook at medium heat until you can easily slide a spatula or tongs underneath and it lifts easily away from the pan. As Cooking Light says pithily, “It’ll release from the pan when it’s ready. 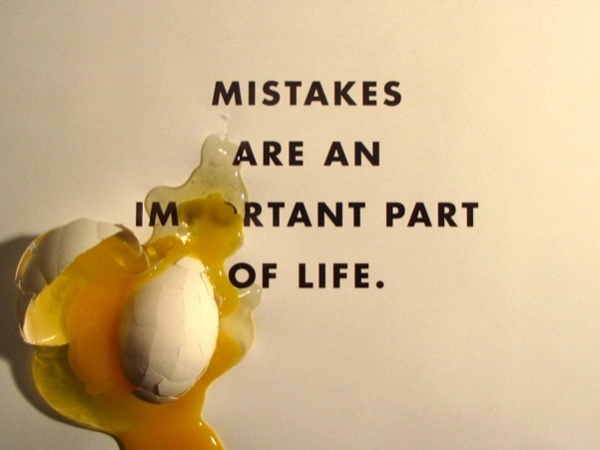 Don’t try to pry it up – the crust will stick to the pan, not the chicken.” And don’t forget to let it rest before serving! Frank actually hates asparagus, but I love them and have avoided them through 4 years of marriage. 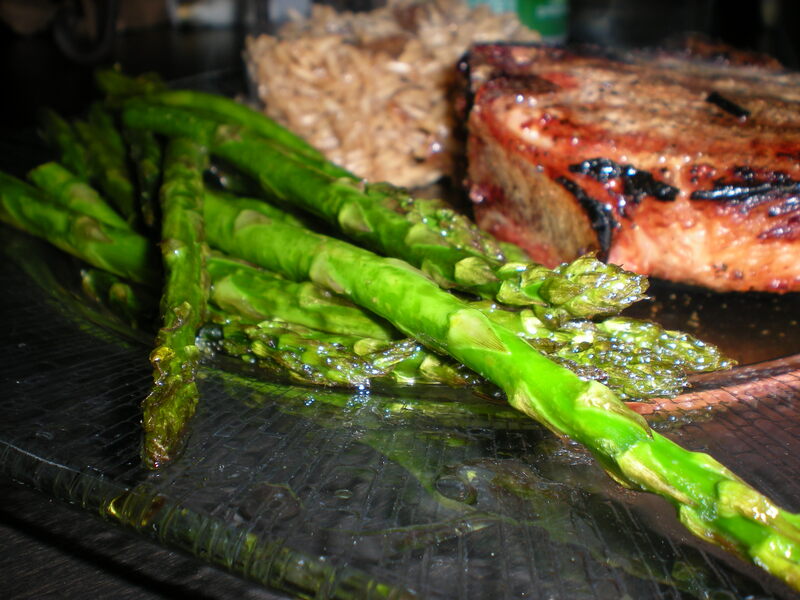 But last night, to spice up a dull Monday and just be overtly rebellious in general, I decided to risk it all and cook asparagus with our grilled pork chops and lake rice. I know you’re all thinking, what a terrible wife, I make him eat vegetables, but I did. I admit it. And guess what? He really liked them…enough to where he said I could even make them again! I love nothing more than victory, especially when I’m right. 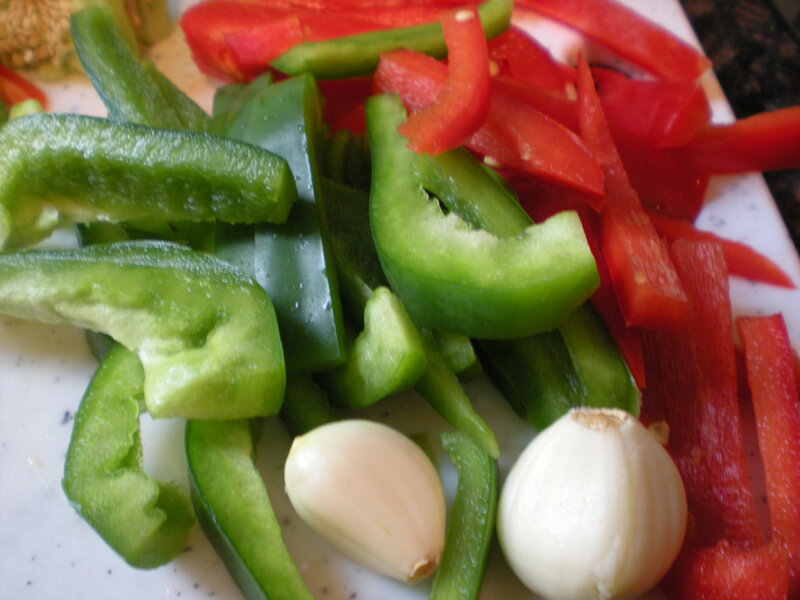 Enjoy these simple, healthy, colorful veggies with just about any kind of entree or main dish. They are just starting to peak, too…asparagus is at its best in the Spring. Preheat oven to 400. Take the asparagus, wash and break them off at the ends. BEGINNERS TIP: asparagus will naturally break at a certain point near the bottom, if you slightly bend it to snap off the bottom. It’s kinda fun. Place the asparagus on an aluminum foil-lined cookie sheet and drizzle the olive oil over them, rolling them around to coat them well. Salt them to taste and then roast at 400 for about 10 minutes. Don’t leave them in too long or they will char and shrivel up (not good). Right before serving, squeeze a half of a fresh lemon over them and serve immediately. Yes, another dinner salad. But this one might be my favorite so far. I borrowed the idea from my friend Jennifer’s fantastic and much-better-done blog, bakinandeggs.com. I adapted it slightly from her recipe, but essentially the idea is exactly the same. As with some of my more recent posts, I’m kind of over winter food and craving the fresh veggies and lighter fare that comes with warmer weather. This salad is a perfect example of a healthy, fast weeknight supper. And the dressing is the best part — it’s a delicious, light type of honey mustard dressing that is super-fast to whip up. I can’t wait to make this in a few months and eat on the patio with a cold glass of Sauvignon Blanc. Preheat grill to 400. Marinate chicken in Italian dressing ( about 1/4 cup total, just eyeball it) and S&P in a Ziplock baggie for 4-6 hours. *If you don’t have time, don’t worry about it, just douse them with the dressing and throw on the grill. Allowing the chicken to marinate over time just makes it more tender, but you can over-marinate chicken, especially with acidic marinades because the acid begins to break down the flesh over time, making the it mushy. Here is a great article on smart marinating tricks. Anyways, moving on. Grill your chicken, about 10 minutes on either side. While the chicken cooks, wash and shred your greens, slice strawberries and avocado and toast your almonds. To toast sliced almonds, pour the amount you want (we use about 1/4 cup for this salad) into a small, 8″ stainless steel skillet (or whatever you have) and set it over low heat. Watch them closely and toss them using the handle to move the skillet back and forth over the eye to get them toasted evenly. You’ll know when they are ready, you can begin to smell the toasted flavor. Remove from heat as soon as they are lightly browned. To make the dressing, just whisk together the ingredients listed above in a separate small bowl. 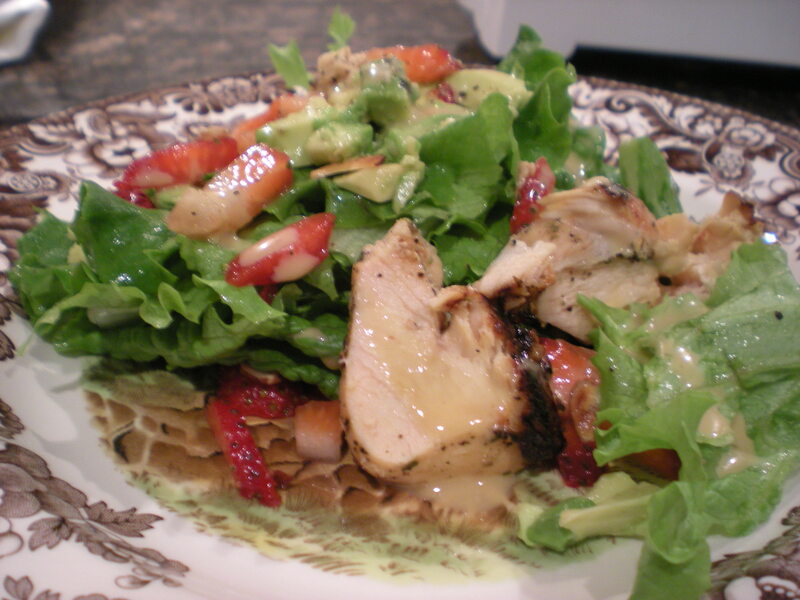 We mixed the cut-up chicken into the salad with the other toppings, but added our own dressing to control the desired amount.